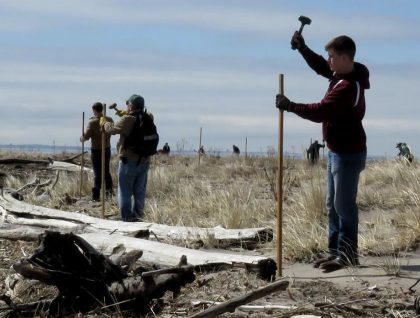 Volunteers pounding stakes for a rope fence that marks the approximate area used by a pair of Piping Plovers in Stratford. Photo by Patrick Comins. March 8, 2018 – Piping Plovers will be migrating back to Connecticut’s beaches any day now and conservationists are preparing to do everything possible to help them have a breeding season as successful as last year’s, starting with training sessions for experienced volunteers and newcomers. There were 66 Piping Plover nests in the state in 2017, the most since records started being kept about 30 years ago. Piping Plovers are listed as threatened under the federal Endangered Species Act. Connecticut’s 66 pairs produced 100 fledglings, only the fourth time 100 or more fledglings have been counted in the state. A good part of that success is because of the work of the Audubon Alliance for Coastal Waterbirds. Its staff and 100-plus volunteers were on the state’s beaches from April through August last year. They scouted out nests. They erected rope fencing and cages. They sat with their binoculars and scopes and took notes on everything they saw. They answered questions and told beach-goers what to do to help protect Piping Plover nests. The result was that by mid-summer, baby plovers were scooting across beaches from Greenwich to Stonington. To get ready for the 2018 season, the Alliance is holding two orientation and training sessions for volunteers on Saturday, March 31, at Audubon Connecticut’s Stratford Point office, 1207 Prospect Drive, Stratford. The first – a review session for those who have volunteered in previous years – runs from 9 to 10:15 a.m. The second session is for new volunteers, and runs from 10:30 to noon. 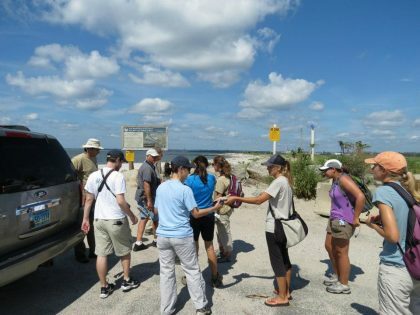 Volunteers gathering at Long Beach in Stratford on a beautiful day last year to work for the Audubon Alliance. Photo by Patrick Comins. Connecticut Audubon is a proud member of the Audubon Alliance, along with Audubon Connecticut (the state chapter of the National Audubon Society), and the Roger Tory Peterson Institute, all working under the guidance of the Connecticut Department of Energy and Environmental Protection’s Wildlife Division. Connecticut Audubon members and donors generously support the Alliance through their contributions throughout the year, including several recent appeals that specifically targeted the protection of Piping Plovers. Volunteers work four-hour shifts starting in April and must donate a minimum of four hours per month. Piping Plovers are just one of several beach-nesting species the Alliance focuses on, along with American Oystercatchers, Least Terns, and Common Terns. American Oystercatchers – protected as a species of special concern in Connecticut – did well in 2017 too: 63 pairs produced 63 chicks. Both were at or near the all-time highs, recorded in 2015 and 2016. While the work of the Alliance has proved to be essential in protecting these birds, they also face threats that are harder to defend against. Storms or unusually high tides, for example, can wash away nests, eggs, and hatchlings. Predators such as foxes, raccoons, and crows eat eggs and birds. And unleashed dogs can cause havoc. But the work of the Alliance is still Connecticut’s best best for helping plovers, oystercatchers, and terns thrive.